Is it because it’s required? Because you need it for Medicaid billing? Because you know progress reports will be a pain if you don’t? Or because it helps you provide better therapy? Data was the main thing I relied on to give myself a little boost of confidence. I was eager to get feedback from students, teachers, parents, my principal, and other SLPs, but there wasn’t a whole lot of that! Data was the only thing I could consistently use to evaluate how I was doing. The only problem was that it was so incredibly time-consuming! It took a lot of trial and error to streamline the process. (You don’t want to know how many data collection systems I’ve tried…!) After several years, I feel like I finally found a good routine. I finally feel (mostly) confident* about how I’m doing as a therapist. * Let’s be real! We see so many students with a wide range of diagnoses. There’s no way we can know it all. There’s always something to keep me on my toes. Luckily, I can connect with colleagues, read research articles, and complete CEUs to figure things out. I use the data to “course correct” as needed. It’s quite the overwhelming process, isn’t it? We have anywhere from 30 to 100s of students… All of whom have multiple therapy goals. How are we supposed to keep up with all of those goals? 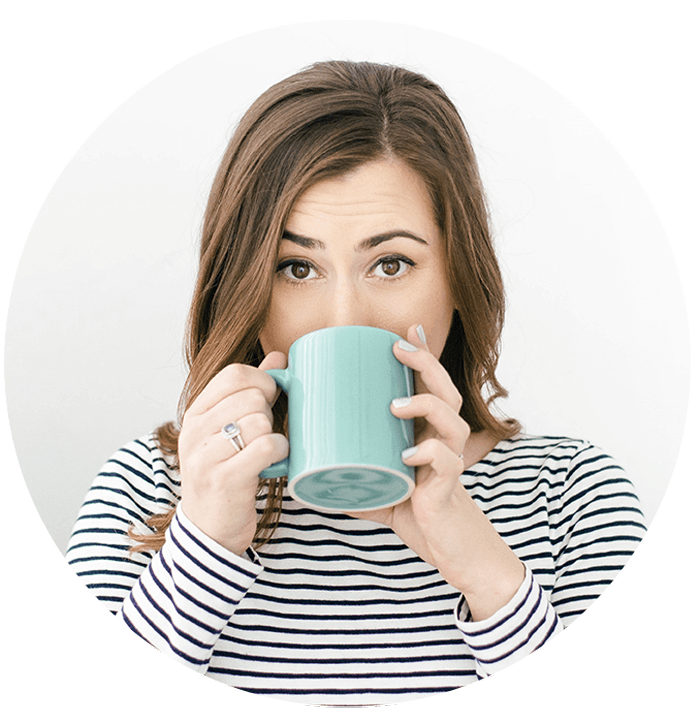 I’m going to share how I keep up with the data using SLP Now, but I encourage you to find whatever system will work best for you. One of the biggest steps for me was getting all of my caseload data organized. Once I knew who was on my caseload and what each student’s goals were, I immediately felt more confident. In order to plan for therapy, we need to know who we’re seeing and when. 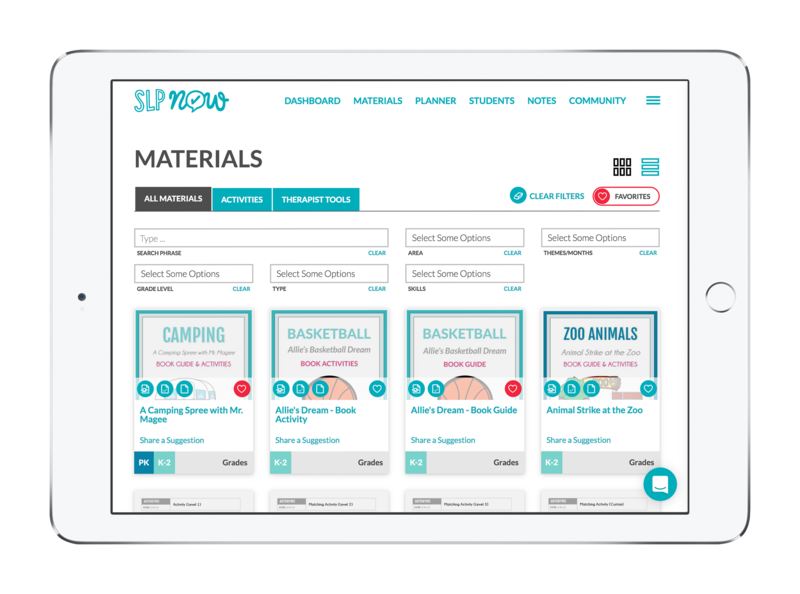 The SLP Now planner makes it really easy to do that! You can set up your schedule for the year in just a few clicks. Now, we need to figure out what we’re going to be doing in therapy. 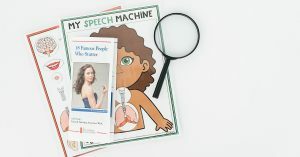 SLP Now includes a library of materials incorporating evidence-based strategies. 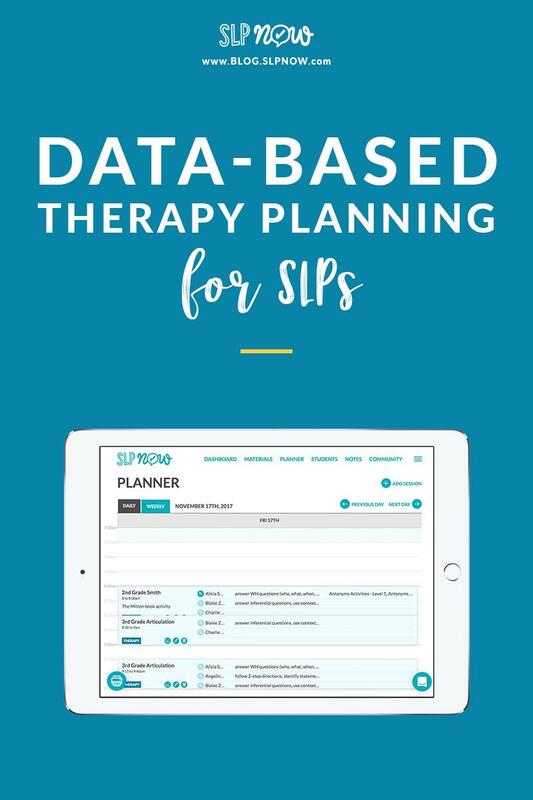 We are incredibly busy as SLPs, but the low prep, engaging materials make it possible to plan effective therapy without spending hours every week. Best part? You can easily add the materials to your session. I got into a routine of reviewing my students’ progress and planning the next week of activities on Friday afternoons. Once I got into a routine, it only took me 10 minutes to plan the activities for the following week. Especially during the crazy weeks filled with paperwork and meetings, it felt really good knowing that I had a plan for my students. No more running around like a headless chicken trying to gather materials! The fun part… Collecting data! I said goodbye to massive binders and folders taking over my speech room and started to take all of my data digitally. I love it because I enter the data in one convenient place, and SLP Now organizes it for me. It makes it really easy to bill Medicaid, write progress reports, and fill in present levels for the IEP. When I’m doing my planning at the end of the week, I can quickly glance at a student’s graphs. Are they making adequate progress? Did I forget to target any goals? This makes it really easy to be proactive! If a student isn’t making progress, I can do some troubleshooting. I can try a new technique or reach out to the IEP team. Being proactive has significantly reduced the number of awkward IEP meetings, and my students are making better progress! Leave us a comment and let us know how you plan for therapy! I am moving into a position with the alternative schools for my district that will mean that approximately 25% of my caseload could potentially change every 45 days as kids are evaluated for transition back to their home school. Do you have any suggestions for efficiently tracking data with that much transition? 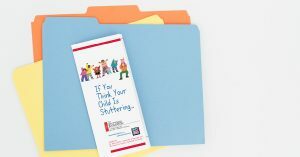 If you prefer paper, these data sheets could work well (https://www.teacherspayteachers.com/Product/Editable-Data-Sheets-for-SLPs-2036461). 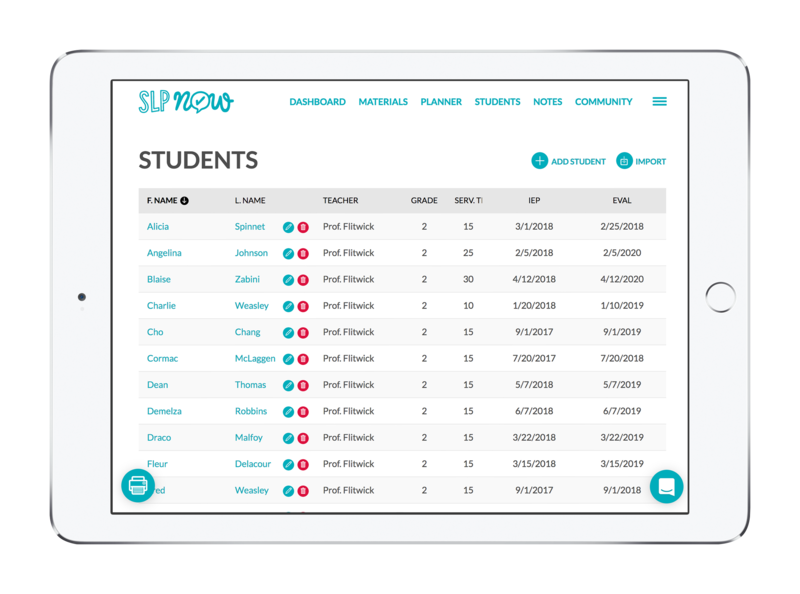 You would need to set up each student’s datasheet, but that would be a good time to review the student’s goals. I think I would personally go digital! I’ve found that it cut down my time to set up each student. 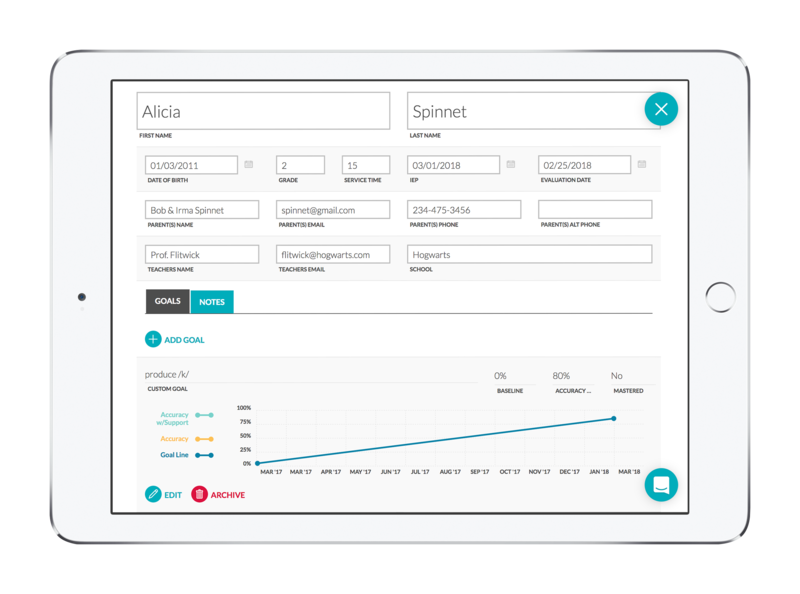 It might also make it easier to organize and share the data with the homeschool. Is there a way to print out the progress monitoring information? We are required to turn it in in our district several times per year. This looks awesome! How do you take data during sessions though? 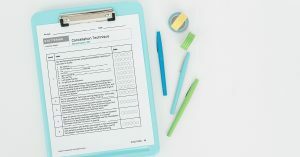 Do you use separate paper data sheets during sessions and put it into the planner later? I find that this data tracking system is super easy and saves me so much time. I see kids online and it keeps things more organized. Your site is a lifesaver! My favorite part is the data keeping and copy/paste feature which REALLY speeds up medicaid billing. It was a little extra time on the front end but the billing end is *priceless*. Thank you!